I was surprised to find out that my mom and sister eat their oatmeal the same way I used to when I was in school – straight up, cooked in water, with a splash of milk, plus sliced banana and some sort of sweetener. It is my go-to oatmeal combination. But I also enjoy adding other toppings to switch up the flavors and prevent oatmeal burn-out. I decided to try to come up with some more oatmeal combinations that I could share with my family, but I’m going to share them with you guys, too. 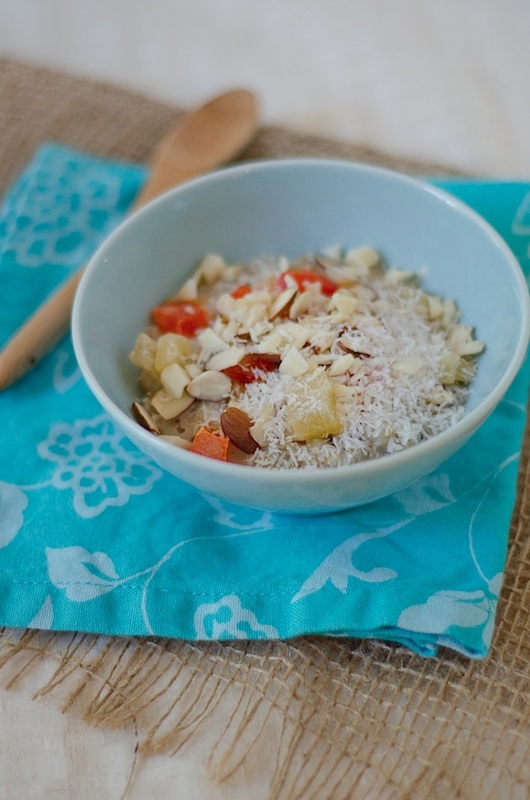 Here’s the first one I’ve done recently…Although it’s now fall, I thought it would be fun to try out an exotic take on this breakfast classic with this Tropical Oatmeal recipe! And thanks to the use of dried fruit, you can enjoy this breakfast year-round. I picked up a couple small bags of various, dried tropical fruits in the bulk bins of my local health food store. There were a lot of options, but I decided on papaya and pineapple. And I almost got mango, too. I also picked up some macadamia nuts. You can usually find coconut in the bulk bins, too, but I knew I had some at the house. I wasn’t really sure how my fruit choices would work with oatmeal, but they were surprisingly awesome. Especially the papaya. Who knew? Whether it’s the middle of the summer or you’re just missing the beach on a snowy winter day, you can enjoy this bowl of Tropical Oatmeal any time of year thanks to the use of dried fruits. Check out the bulk bins at your local health food store for a wide selection of your favorite tropical fruits and nuts. 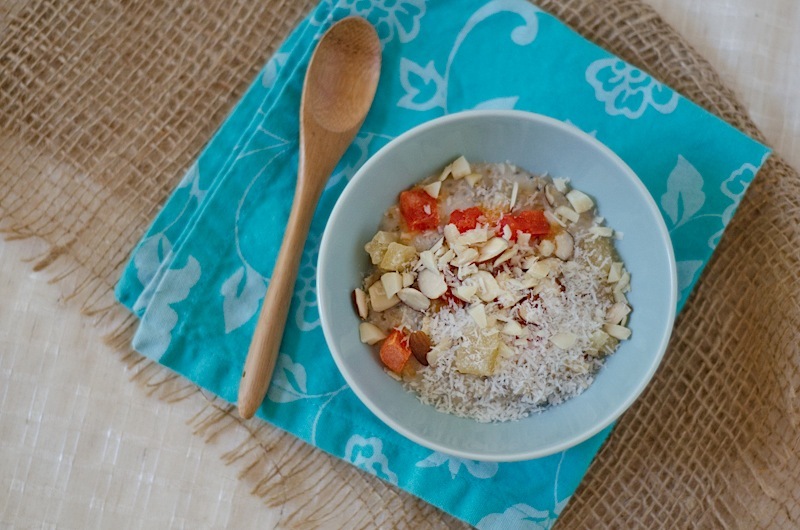 Oh, and unless you can’t consume coconut milk, I highly recommend not substituting it, because I think it really makes the oatmeal taste more exotic and delicious. 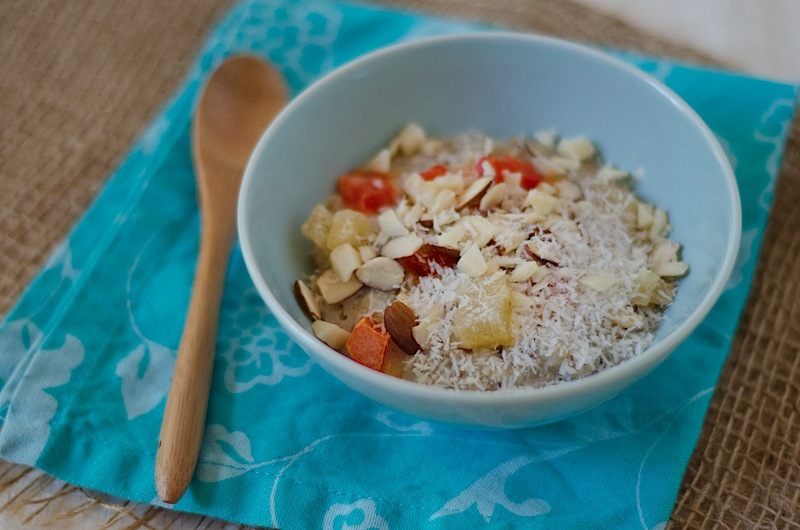 Combine oats, coconut milk, water, and chia seeds in a small, non-stick pot and stir together. Turn heat to medium-low. Cook until oats have thickened to your texture liking, about 8-12 minutes, stirring occasionally. Stir in sliced banana and pour mixture into a serving bowl. Top with dried fruits and nuts and flaxseed, if using. Turn on a Beach Boys song and enjoy! Reader question: What’s your favorite tropical fruit? I made a version of tropical oatmeal once too, but yours turned out much prettier — probably because of the dried papaya. Isn’t it crazy how a pop of color can really change a photograph completely? My favorite tropical fruit is plantains, although I’ve only ever had them fried. I’m not sure if I would like them raw.